Making sense of Maada Bio’s Victory Over The Formidable APC Political Mafia Government, In The Last General Election In Sierra Leone! Can Other Political Leaders In Africa Learn From His Excellency Julius Maada Bio’s Victory In Sierra Leone? The 2018 General Election was a referendum on the APC Political Mafia and its decade of criminal negligence of our long-suffering people. The Voices of the overwhelming majority of Sierra Leoneans were singing a song of freedom, a song of joy. No matter our differences, we are united in our desire for a new start, a new vision and renewed hope for Mama Salone. His Excellency Julius Maada Bio led the way with courage and humility backed by the more significant share of the popular vote. When selecting the next President of Sierra Leone in the last General Election, the beautiful people of Sierra Leone were ready for a change and took into account the circumstances on the ground. They could not ignore the many obstacles in Julius Maada Bio’s path to victory. The backdrop to the election, the elephant in the room, was the formidable APC Political Mafia. A ruthless political mafia ran Sierra Leone’s government. Creating, ever-increasing divisions (tribe, region) and lawlessness on a scale unimaginable only a few short years ago. His Excellency Julius Maada Bio was facing a ruthless well-financed political machine that operated just like the worst mafia organisations around the world—they took no prisoners and were prepared to subvert the democratic rights of our citizens. His Excellency Julius Maada Bio could not match the fundraising prowess of the APC Political machine. They treated our nation’s treasury as a personal “piggy bank” and had total control of all state apparatus. It was the kind of opposition His Excellency Julius Maada Bio was facing. The APC government would do anything to stay in power. They were ruthless. They controlled the National Electoral Commission. They had gerrymandered Sierra Leone to the point that they said 60% of the population was in the north and ONLY 40% in SOUTH and EAST. This was what His Excellency Julius Maada Bio was facing. He was the underdog. That was a considerable challenge even for Maada Bio’s standard. That gave them an unfair advantage; the playing field was never level, and His Excellency Julius Maada Bio did not have the luxury of time and space. Despite all these obstacles, why did His Excellency Julius Maada Bio defeat the formidable APC political mafia government? The answer is not as simple as it seemed but these might help our understanding. His Excellency Julius Maada Bio was the only candidate who had the required EXPERIENCE of running a national campaign. His Excellency Julius Maada Bio was the only candidate who had EXPERIENCE of holding the highest office. He was the only candidate“ tried and tested” at the highest level. There is no substitute for the experience gained at the highest levels. His Excellency Maada Bio was battle-hardened, been there, done that and lived to fight another day. It is worth noting that many of the world’s greatest leaders Thomas Jefferson, George H W Bush, Ronald Reagan, even our own Ernest Bai Koroma failed in their first attempt to gain the highest office. In 2000, Barack Obama lost an election when he ran for Congress. Why were these leaders able to succeed after such painful setbacks? They learned from their mistakes. They were uniquely placed to review and analyse what went wrong and to put it right the next time. His Excellency Julius Maada Bio was uniquely placed to bring his experience to the challenge of overcoming the formidable APC Political Machine. He analyzed and reviewed the mistakes of the past in a way only he could. He was ready to hit the ground running on day one. He had a tried and tested campaign apparatus already in place. It takes many years to forge the type of EXPERIENCE Julius Maada Bio possessed. Could we have afforded to dispense with such accumulated EXPERIENCE at such a critical time? Hell no!!! Many sincerely believed that many of the other candidates possessed huge potential and offered our country the much needed intellectual resources, but the stakes were too high. We could not choose potential over tried and tested experience when facing the most ruthless Political Machine in our country’s history. We Could not! We supported Julius Maada Bio because we believed he was best placed to take advantage of the criteria needed for success. Maada Bio is a man who is humble, discipline, loyal, consistent, time and time again he always asks for the same thing, asking people to work together, put aside our differences, set aside petty hatred, grudges, and let us focus on the things that are very important. These are the reasons why people find Maada Bio appealing because he does not throw money all over the place like some people. He has not got that kind of money. So why did people still find Maada Bio so appealing? It is because he connected with them!! He shared things that matter to them. People want a leader who will come to work with them. People don’t want someone standing over them telling them what to do. They want somebody who can show them respect, acknowledge them and prepare to work with them. Maada Bio has always delivered on that. He always comes to the people and asks them what matters to you! What do the people care about? What are your priorities? And he has shown them that those are his priorities as well. Those are the things he will fight for. That was why he had such a supreme connection with Sierra Leoneans all across the country despite all the propaganda. 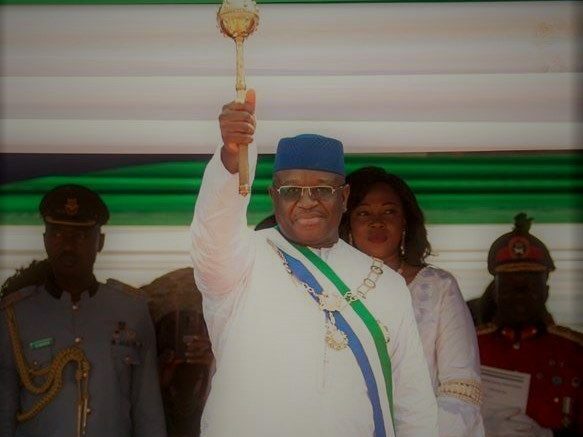 In the recent Presidential Elections over a million registered voters from every region of Sierra Leone voted for him, this is the man who has truly connected with people all over Sierra Leone. Why can’t we trust the other politicians? Kamara and Koroma are both of the same tribe and hail from the country’s Bombali district, of which Makeni is the capital. Makeni underwent rapid development over Koroma’s 10-year presidency and now boasts the country’s only 24-hour electricity supply. Freetown, Sierra Leone’s capital, still suffers from power outages. The Man Who Conjures Something Out Of Nothing!!!! Be the first to comment on "It Is Time For The APC Political Mafia To Go!"